Elegantly styled and fragrant wine with notes of honey and minerals followed by lingering citrus flavors. The wine was fermented at very low temperatures in stainless steel tanks. Fermentation was stopped at the desired sugar levels, resulting in an elegant, off-dry style wine. A highly terroir expressive cultivar, this Riesling is produced in a typical German kabinett style with a semi-sweet residual sugar. 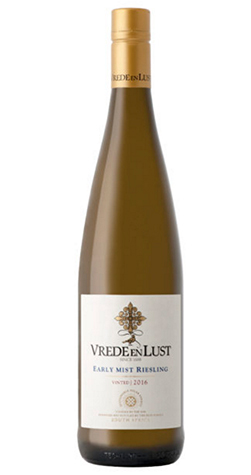 Vrede en Lust, derived from the Dutch "Peace and Eagerness" is a modern wine farm, building on a 320 year old foundation. The farm is located in the center of the Cape Winelands, on the eastern slopes of the Simonsberg, and nestled in between the top notch Rupert de Rothschild (Fredericksburg) and Plaisir de Merle estates. The vineyards are classified under the Wine of Origin ward Simonsberg-Paarl, as part of the Paarl Wine Region.